Java developers have recognized the need for batch applications a really long time ago, but have had to get by with non-standard approaches – until now. JBatch (JSR-352) introduces an exciting Java specification for building, deploying, and running batch applications, thus standardising the development of such applications. Currently JSR-352 is part of the Java EE 7 specification and has full access to all other features of the platform, including transaction management, persistence, messaging, and more, offering the developer very robust data processing opportunities. In this article, we will create from scratch, a small web application which demonstrates the use of JSR-352 on Apache TomEE server. JSR-352 is defined for both Java EE 7 and Java SE 6 platforms. While nearly all of JSR-352 is common between Java EE and Java SE environments; this article will focus exclusively on JSR-352 as part of Java EE 7. JSR-352 addresses three critical concerns*: a batch programming model, a job specification language, and a batch runtime. This constitutes a separation of concerns. Solution integrators have a runtime API for initiating and controlling batch execution. JSR-352 defines numerous batch programming APIs that help to implement batch business logic. Commonly used among these are ItemReader, ItemProcessor, and ItemWriter, which define the basic runtime contracts for reading, processing, and writing data items for a batch step. Other APIs are available for building task-oriented steps, interposing on lifecycle events, and controlling partitioned steps. Batch steps are organized into jobs, which define the run sequence. JobOperator runtime interface is used to run and interact with jobs. Jobs may have flows; steps that can be executed in multiple threads. Job executions are stored in a repository, enabling query of current and historical job status. 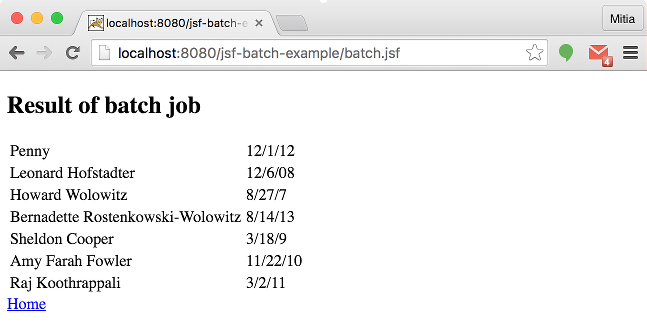 Batch jobs are described in xml files that should be placed in /META-INF/batch-jobs folder. Each xml has as root element. Each job may contain multiple steps. Consult the JSR-352 Home Page for additional details. The Apache TomEE server is currently certified and fully compatible with Java EE 6 specification. Work is in progress to make Apache TomEE fulfill the Java EE 7 specification. 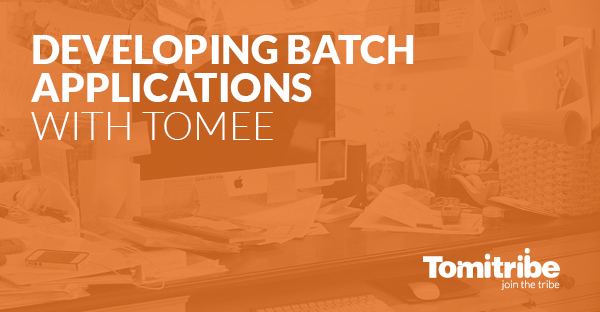 You can find TomEE Batch Support in the latest milestone Apache TomEE 7.0.0-M3 Plus profile. Currently the reference implementation of JSR-352 is provided by IBM. Apache BatchEE is based on this implementation and the one shipped with TomEE. It includes a set of enhancements that allow BatchEE to provide custom implementations to readers and writers (JdbcReader, FlatFileItemReader, StaxItemWriter, to name a few). It also allows BatchEE to provide integrations with other platforms like Hazelcast, Camel or Groovy. Finally, it also ships with it’s own web console to monitor and manage Batch Jobs. Let’s have a look at a full scale example from the Java EE 7 Tutorial written by Arun Gupta and Roberto Cortez, and adopted for the article. Imagine that it is required to process a csv file with Person data, import it in a webapp and then list it. The persons will be the characters from the adorable Big Bang Theory TV series. The webapp should consist of two pages. On the first one there is a button to trigger import and on the second we visualize them. We will use JSF for visualization. Now the fun part – JSR-352! As mentioned previously, JSR-352 defines multiple standardized approaches. There may be simple small pieces of work implemented in batchlets or there may be full scale readers, processors and writers. That’s exactly the most suitable way for the current spec. finally it should be stored using service. The reader should extend AbstractItemReader. Method open is used to get csv file; it’s called only once. Then with the method readItem, a piece of data is extracted, in our case one line from the file. As seen from the code the processor should extend ItemProcessor. In the processItem method the line string passed from the reader is parsed into Person and is being returned. The writer extends AbstractItemWriter. In the method writeItems the parsed from the string Persons are stored using the PersonService. Now the processed data has to be visualized. RequestScope-d backing bean will be just OK. Java EE 7 specification allows the container to manage the JSF beans so it can be annotated as Named. PersonService is injected as it provides access to the Persons. Basically that’s it! Now just run the app! If we take a look at the console we will see that BatchEE runs properly. Notice that the data is processed in a chunk of three. That’s basically it! JSR-352 integrates with Apache TomEE really seamlessly! Especially on the latest versions and BatchEE is a great implementation for that. The example above demonstrates just a small part of JSR-352 possibilities. More examples can be found at https://github.com/javaee-samples/javaee7-samples/tree/master/batch. JBatch (JSR-352) is a really robust framework which provides a standardized way of data processing. Bulk data processing is an essential part of most enterprise applications. JSR-352 defines a powerful programming model and runtime to easily build, deploy, and run mission-critical batch applications. Now that JSR-352 is part of Java EE 7, users can benefit from its full integration in the specification stack. The example project demonstrated in the article can be found here: https://github.com/dalexandrov/jsf-batch-example.